A trip to New York is an experience of a lifetime. 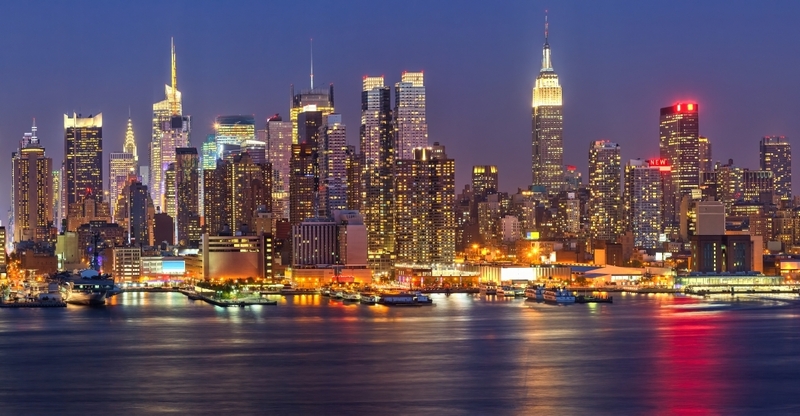 New York is the epicenter of the arts, dining and shopping capital, trendsetter. 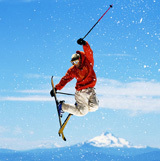 There are so many things to see and do that you have to someway make a draft agenda for each day of your stay. Let’s start with the must sees. Statue of Liberty – Is perhaps New York City’s most familiar landmark and the easiest one to overlook since it’s only accessible by boat. This historic monument has welcomed so many generations of hopeful Americans to our shores. The American Family Immigration History Center at Ellis Island contains more than 25 million Port of New York passenger arrival records and 900 ship pictures circa 1892–1924. You can catch the free Staten Island ferry for a 25 minute ride. From the deck of the ferry you will have a perfect view of The Statue of Liberty and Ellis Island. You’ll see the skyscrapers and bridges of Lower Manhattan receding as you pull away and coming into focus again as you return. A typical weekday schedule involves the use of five boats to transport approximately 70,000 passengers daily (109 daily trips). During the day, between rush hours, boats are regularly fueled and maintenance work is performed. Central Park – One of the world’s most renowned green spaces, Central Park comprises 843 acres of meadows, manicured European-style gardens, a lake and reservoir — not to mention an outdoor theater, a memorial to John Lennon, an idyllic waterside eatery (the Loeb Boathouse) and a famous statue of Alice in Wonderland. 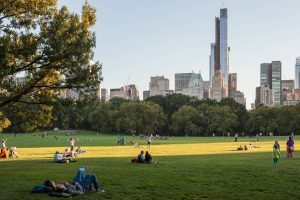 Highlights include the 15-acre Sheep Meadow, where thousands of people lounge and play on warm days; Central Park Zoo; and the forest-like paths of the Ramble. Metropolitan Museum of Art (MET) – The vast collection of art contained within this palatial museum (founded in 1870) is one of the world’s largest, with more than two million individual objects in its permanent collection: paintings, sculptures, textiles and artifacts from around the globe – even an ancient Egyptian temple straight from the banks of the Nile. ‘The Met’ has 17 acres of exhibition space to explore, so plan to spend at least several hours here. If visiting April through October, head up to the excellent roof garden, which features rotating sculpture installations by contemporary and 20th-century artists – though the grand city and park views are the real draw. Enjoy a sundowner cocktail from its on-site bar. Self-guided audio tours (adult/child $7/5) are available in 10 languages; download the Met’s free smartphone app for excerpts. Guided tours of specific galleries are free with admission. Admission fee: pay what you wish. 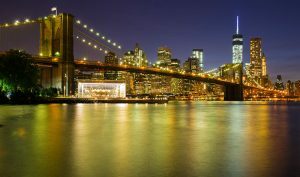 Brooklyn Bridge – One of New York’s most recognisable landmarks, the Brooklyn bridge was built in 1883, and its limestone and granite neo-gothic towers make it far more imposing than the steel bridges that followed it further up the East river. The bridge’s pedestrian and cycle pathway is elevated, so it offers fantastic views of the Manhattan skyline and downtown Brooklyn. It can be a bit of a scrum on there sometimes as tourists stop for photos and to attach love locks to its metal latticework fencing – so walking across may take longer than you think. There’s lots to see and do here. You’ll find free open-air summertime events like film screenings, outdoor yoga/Pilates classes and dance parties (often on Pier 1); courts for basketball, handball and bocce, plus a roller-skating rink (Pier 2); kayak and stand up paddleboard hire (Pier 4 beach); fantastic playgrounds and a watery play area (Pier 6); and even a new bouldering wall (at Main St Park, under the Manhattan Bridge in Dumbo). High Line – A favorite destination for New Yorkers on weekends. 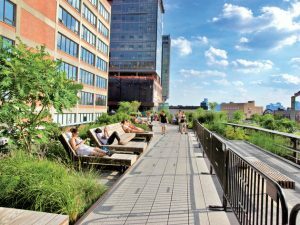 It is hard to believe that the High Line is a shining example of brilliant urban renewal – was once a dingy rail line that anchored a rather unsavory district of slaughterhouses. Today, this eye-catching attraction is one of New York’s best-loved green spaces, drawing visitors who come to stroll, sit and picnic 30ft above the city – while enjoying fabulous views of Manhattan. Museum of Modern Art (MoMA) and/or Guggenheim Museun – Superstar of the modern-art scene, MoMA’s galleries scintillate with heavyweights: Van Gogh, Matisse, Picasso, Warhol, Lichtenstein, Rothko, Pollock and Bourgeois. Since its founding in 1929, the museum has almost 200,000 artworks, documenting the emerging creative ideas and movements of the late 19th century through to those that dominate today. MoMA’s permanent collection spans four levels, with prints, illustrated books and the unmissable Contemporary Galleries on level 2; architecture, design, drawings and photography on level 3; and painting and sculpture on levels 4 and 5. Many of the big hitters are on these last two levels, so tackle the museum from the top down. Must-sees include Van Gogh’s The Starry Night, Cézanne’s The Bather, Picasso’s Les Demoiselles d’Avignon, and Henri Rousseau’s The Sleeping Gypsy, not to mention iconic American works like Warhol’s Campbell’s Soup Cans and Gold Marilyn Monroe, Lichtenstein’s equally poptastic Girl with Ball, and Hopper’s haunting House by the Railroad. Guggenheims Museum Housed in one of the most iconic buildings in New York and is filled with prized pieces, including works from Picasso, Kandinsky and Miró. The Guggenheim always presents interesting and innovative exhibitions, and the museum’s layout is like no other, as visitors experience the artwork along a huge ramp that spirals up around the entire interior of the cylindrical building. 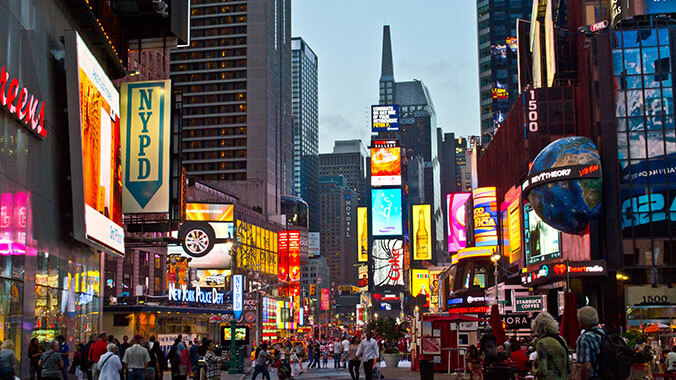 Times Square – Times Square is where it all happens. Twenty-four hours a day, seven days a week, the bright lights, big screens and bustling crowds perfectly embody the excitement of the city that never sleeps. For the greatest effect, visit after sunset. Its main junction is filled with popular retailers—plus the TKTS discount booth, which offers up to 50 percent off theater tickets. Walk to the top of its red steps—you may know them from the «Empire State of Mind» video—for a sweeping view of the area, including One Times Square, the building from which the ball drops on New Year’s Eve. People-watchers will love the pedestrian-only zones furnished with tables and chairs. 9/11 Memorial – While the September 11 attack has already passed into history as the geopolitical turning point of the early 21st century, the 9/11 memorial (tickets for the museum cost $24 for adults, free on Tuesdays from 5pm) by architect Michael Arad and landscape architect Peter Walker successfully turns the focus back on to the nearly 3,000 people who died in the atrocity. The memorial consists of two enormous waterfalls pouring into the foundations where the Twin Towers once stood, with the names of the victims cut into a metal rim around them. It communicates a powerful sense of loss and absence – $2 Reservation Fee. Note: Please be respectful of those who passed away here and don’t remove the flowers or take smiling selfies. Walk a few streets over to see the Woolworth Building, one of New York’s prettiest early skyscrapers dating back to the 1910s. 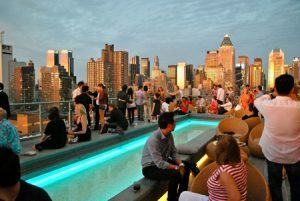 Some other hints for your visit in New York is that you can enjoy the marvelous view from a bar’s rooftop with a cocktail, without spending extra money for entrance fee in the Empire State building or Rockefeller Centre or the 1 World Trade Center which each cost about 30$. The best in town is the Standard hotel in the Meatpacking District, which has a beautiful copper-coloured bar on the top floor and a busy roof garden overlooking the Hudson River. The staff can be a bit sniffy about who gets in – in the evening – but they’re friendlier in the afternoon. Also worth trying is 230 Fifthin Midtown, while in Williamsburg, Brooklyn, the Wythe hotel has a sweeping view across the East river of the Manhattan skyline. It’s unbeatable in the early evening as the sun goes down. The Brooklyn Heights Promenade (also called the Esplanade ) is a pedestrian walkway which offers spectacular views of Downtown Manhattan, the East River and the Brooklyn Bridge. It’s a favorite destination for joggers, walkers and Rollerbladers, but it also offers a quiet atmosphere for those who prefer to just sit, chat and enjoy the view. The Promenade is lined with grand town houses and mansions, and is part of Brooklyn’s first Historic Preservation District. Visit the Grand Central Station – is one of New York’s beaux-arts beauties. Adorned with Tennessee-marble floors and Italian-marble ticket counters, its glorious main concourse is capped by a vaulted ceiling depicting the constellations, designed by French painter Paul César Helleu. When commuters complained that the sky is backwards – painted as if looking down from above, not up – it was asserted as intentional (possibly to avoid having to admit an error). Discover the secret of the whispering gallery – stand with your ear right up against the tile work in the domed intersection of walkways on the lower floor of Grand Central Terminal and you’ll hear even the quietest sweet nothing, soft song, or whispered threat, even over the din of crowds. 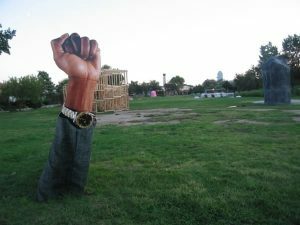 Take a walk to the Socrates Sculpture Park an open studio and exhibition space for artists, as well as a neighborhood park. 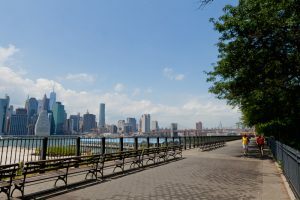 It is now an internationally renowned outdoor museum and park offering a host of free family programs and a place to picnic or walk along the East River with a view of Manhattan’s skyline. Explore NY by bike at your own pace. You can pick one Citi Bike from the city’s on-street cycle-hire scheme. There are stations spread across Manhattan below 60th Street, and in several areas of Brooklyn including Williamsburg, Brooklyn Heights and Fort Greene. Twenty-four hour access costs $9.95 although, if a single journey lasts longer than 30 minutes, you begin to rack up extra fees. For a longer ride, you would be better off hiring a bike from one of the numerous cycle shops in the city. Visit Chinatown and Little Italy in Manhattan New York to enjoy food, culture, entertainment, and shopping. There are a number of restaurants to choose from, as well as gifts to take home from the market. There is a little something for everyone who comes to enjoy a little piece of China right in New York. New York’s Chinatown conveniently located right next to Little Italy on Manhattan Island is one of the oldest and largest Chinatown’s outside of Asia. It is one of the largest surviving ethnic Chinese communities that are still operating with as many Chinese residents as others. There are a number of landmarks in Chinatown that tourists or locals can go to see when weather prevails. Chinatown, along with Little Italy in New York was listed in a historic district on the National Register of Historical Places in 2010. Stop in Chelsea Market for a delicious brunch in any of the stalls before walking around chic Chelsea. This area, which used to be the meatpacking district, has great boutique shopping and antique shopping. Take a Free Tour which offers numerous tours of Manhattan and Brooklyn. 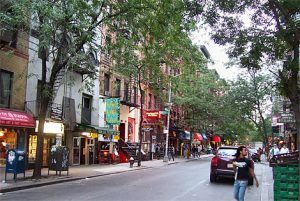 You can also visit Greenwich Village (often simply referred to as «the Village») Greenwich Village may not be as bohemian as it was in its beatnik heyday, but it’s still home to some of the city’s best old-time jazz clubs, pubs, bars, restaurants and delis. Have a drink to Williamsburg which is the epicenter of Brooklyn. 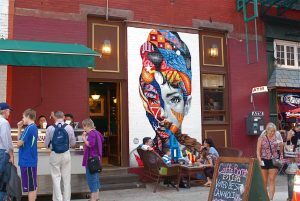 The neighborhood may have rents higher than Gramercy and more crowds than Soho, but it’s popular for a reason: The quaint streets are lined with inventive New York restaurants, rooftop bars and eclectic shops, and throngs of people flock to the waterfront for flea markets and giant food bazaars during the summer. 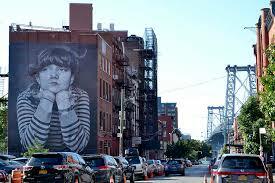 If you want to see the real New York, you need to head to Brooklyn. These days, the name is shorthand for ‘artsy cool’ the world over, but there’s far more here than hipster stereotypes. This sprawling borough (more than three times the size of Manhattan) is actually home to some of NYC’s most interesting, historic and culturally diverse neighborhoods, with singularly fantastic dining, drinking, shopping and entertainment options – not to mention some of the best river views in the five boroughs. You should go also to a jazz bar or and by a ticket for see a show. New York is HUGE. I sometimes joke that you need about two weeks to just cover the major sights, which is true since I didn’t even include Coney Island (Brooklyn). You know that saying: ANYTHING CAN HAPPEN IN NEW YORK? Well, it’s true, including the fuzzy feel good stories that made Humans of New York famous, people carrying around kittens on the subway, seeing some of the world’s best fashion on the street, spotting celebrities walking into your neighborhood deli, impromptu dancing in the street, and even getting discovered by modeling agents (it happened to Jennifer Lawrence). New York City can wear you down, but if you allow it to show itself to you with all its quirks, beauty, and charm, you’ll fall in love with New York (or just really hate it). I hope you get the chance to judge it for itself.